The truth is – if you are a Ph.D. student in any field (especially a field like theology!) its going to be really hard to come by a tenured position. And it seems like most people don’t have the skills to turn their hard years of dissertation work into a job that can sustain a family. Some people seem to get lucky and really score, others however seem to get stuck in the treadmill of adjunct teaching. Not that there’s anything wrong with that, as a theology prof you might be a pastor and do some adjunct teaching on the side because you enjoy it – but you will certainly find it hard to sustain a family with just an adjunct teaching job. 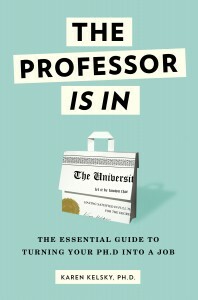 Karen Kelskey’s The Professor is In is an attempt by a former R1 professor to help recently graduate PhD’s avoid the adjunct trap and get stable jobs teaching in their respective fields. This book covers everything you need to know about getting a job as a professor. It addresses the myths of professorial life, traps that graduate students fall into, the types of insitutions that are out there, how to write a good CV, getting teaching experience, presenting at conferences, writing your research statement, writing your cover letter, interviewing for your first job, doing a job talk, wrangling down references, evaluating the campus’s climate, and even how to negotiate the job offer. I’m a few years out from applying for a job as a professor, so I will certainly be turning back to this book when that time comes. In the meantime though, it was an eye-opening read – I really saw the “mess” that I am about to get myself into, and it reminded me that regardless of how messy it might be, at the end of the day its worth it. Final thought: This is a book that every graduate student hoping to get a job in academia should read. It covers everything you need to get that job you were hoping for. Next Next post: Every Word Biblical Commentary Volume is on Sale for Just $9.99!